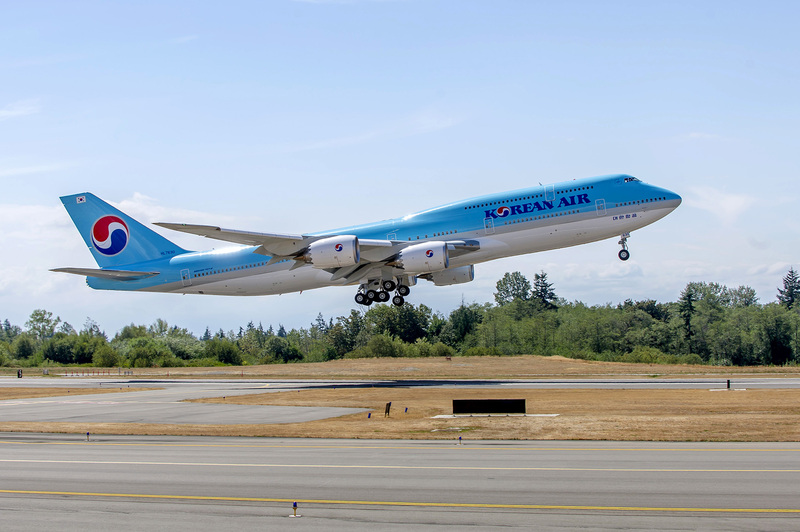 This week marked the arrival of Korean Air‘s new 747-8i passenger aircraft. The first of 10 on order, these new aircraft are heralded as the flagship airframe for this South Korean airline. KAL, which already operates seven 747-8 freighters, has become the first airline in the world to operate both the passenger and freighter version of the 747-8, and operates a large Boeing fleet. About 70% of the 747-8i, by structural weight, incorporates new advanced aluminum alloys and carbon composites to reduce the weight drastically and giving a 16% improvement in fuel consumption and emissions over its predecessor the 747-400, while generating 30% less noise. With a range of 14,815km, the new B747 will be the fastest wide body passenger jet in the world with a normal cruising speed of Mach 0.86. 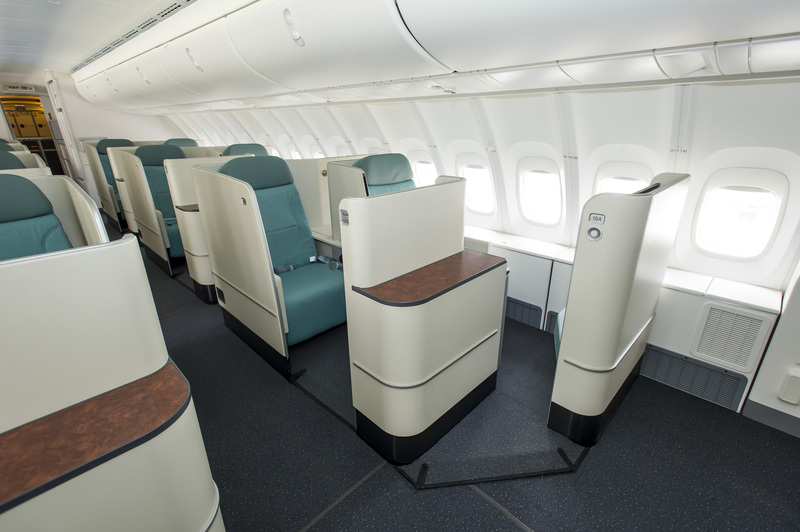 Passengers will indeed be rejoicing, especially in the premium cabins. The new B747-8 Intercontinental is configured with 368 seats in a three-class configuration; 6 First Class, 48 Prestige Class (26 seats on the upper deck and 22 seats on the main deck) and 314 Economy Class. 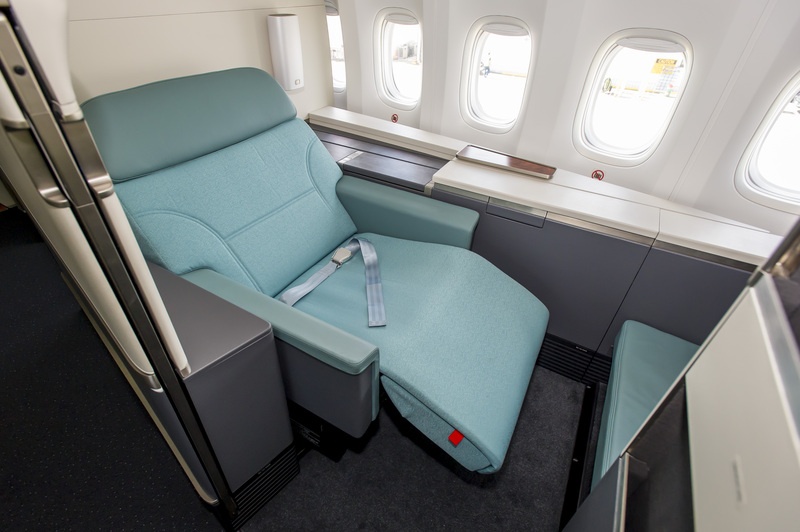 The aircraft also features Korean Air’s brand new First Class Kosmo Suites 2.0 designed with a sliding door and higher partitions to provide added privacy for passengers. We have some exclusive shots of the new interior. The first class suites are also equipped with updated in-flight entertainment systems, with large 24-inch high-definition monitors and new handheld touch remotes. 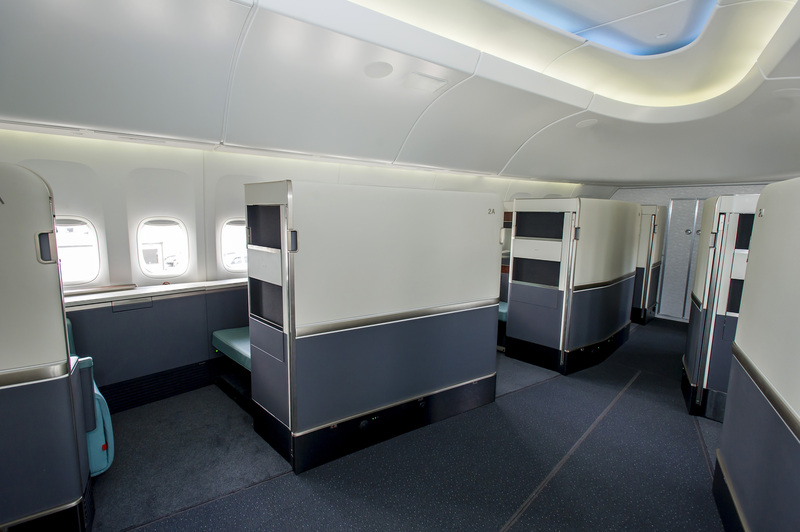 The airline’s Prestige Class Suites will feature staggered seating and privacy panels, along with 18” high definition touch screens. The aircraft also features an all-new, 787 Dreamliner-inspired interior that includes new curved, upswept architecture, giving passengers the feel of more space and comfort. 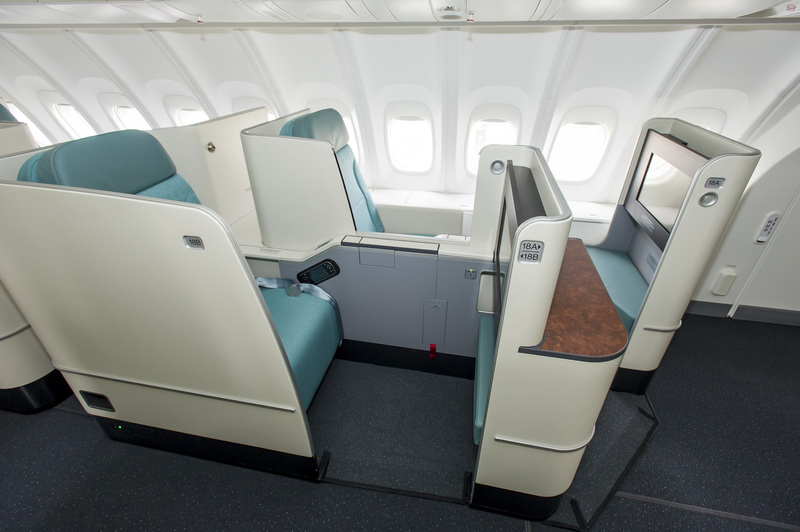 We really like the new interiors, and whilst they are perhaps a little basic in colour tone, the comfort in both business class and first class is definitely in the top league of its class, offering every premium passenger direct-aisle access, forward facing seats and enhanced privacy. Whilst the A380 has both a ‘Celestial Bar’ and the walk-in duty-free shop, the carrier has opted against both on this configuration, instead investing purely in seat comfort. This 747-8i is going to be one of the hottest tickets on Korean Air’s fleet. No wonder they are positioning it on their high-yielding routes. Hopefully we may see a retro-fit of the rest of the fleet, depending on the success of these new products. Glad I finally found some of the new 747 layouts. Two concerns. No pictures of the CENTER seats in J. Which leads to the other part. Why don’t they realize that some people travel together and want to dine, drink, chat and watch movies together? Hello? Looking at the seat map the lower J center seats appear to be his & hers style.